The methods of deactivation and reclamation of tailings ponds are studied. The engineeringgeological investigations of apatite–nepheline ore flotation tailings in the sites applied with chemicals at ANOF2 processing plant of Apatit Company are carried out. The monitoring of the bonding surface generated by dust suppression agents Alcotact DS1, Dustbind and Floset S44 is performed. 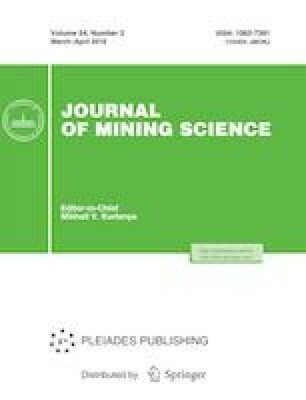 The physical properties and the aggressive action resistance, as well as the effect of suppression agent feed in recycling water on the apatite–nepheline ore flotation performance are tested on a laboratory scale. The Dustbind is recommended as the optimal suppression. Original Russian Text © V.A. Masloboev, A.V. Svetlov, O.T. Konina, G.V. Mitrofanova, A.V. Turtanov, D.V. Makarov, 2018, published in Fiziko-Tekhnicheskie Problemy Razrabotki Poleznykh Iskopaemykh, 2018, No. 2, pp. 161–171.